Get ready to be mesmerized with the vibrant Samsung Galaxy Tab A T285 that looks amazing in black and oozes brilliance from every angle you look at it. The huge 7inch IPS LCD capacitive touchscreen produces detailed images at resolutions of about 800 x 1280 pixels. This tablet allows you to capture precious moments with its 5MP autofocus rear and 2MP front camera. It houses a ROM with a generous internal storage capacity of 8GB, which can comfortably accommodate loads of data. The Android v5.1.1 operating system makes using this tablet simple and intuitive. The 1.5GB RAM, coupled with the 1.3GHz Quad Core Cortex A53 CPU, makes working on multiple apps a glitch free experience. Getting connected to the Internet or friends isn’t much of a hassle on this tablet, as it supports the fast 4G LTE and WiFi connectivity networks. Another standout feature of the Samsung Galaxy Tab A T285 is its nonremovable 4000mAh Lithium Ion battery that delivers a talk time of 11 hours. The Samsung Galaxy Tab A T285 reviews speak highly of its quick processing capabilities. At its heart, you will find a 1.3GHz Quad Core Cortex A53 CPU that sits on the Qualcomm MSM8916 Snapdragon 410 chipset. The processor, together with the 1.5GB RAM module, does its best to give you a glitch free and smooth operation. This tablet is highly interactive and user friendly, which is owing to the preinstalled Android Lollipop v5.1.1 operating system. The OS not only offers a flexible menu system but also provides built in Google Apps that make using it all the more convenient. When in need of more content, you can visit the Play Store and download apps, games, and more via a Google account. The Samsung Galaxy Tab A T285 specs peg its screen size at a massive 7inch, which is sure to make your movie watching or image viewing experience more enjoyable. Along with a pixel density of about 221ppi, this screen has a display resolution of 800 x 1280 pixels! Its IPS screen technology offers a wide viewing angle with precise clarity from every direction. The Samsung Galaxy Tab A T285 camera at the back, with a resolution of 5MP, captures gorgeous shots. It supports autofocus and has an f/2.2 aperture size. You can also make use of this camera to record 720p videos at 30 frames per second. If you’re a selfie fan, then this tablet also incorporates a 2MP snapper at the front. You can share all your pictures and videos with compatible devices using the Bluetooth v4.0 functionality or transfer them to a PC using the microUSB v2.0 port. The Samsung Galaxy Tab A T285 features a massive 4000mAh battery that gives you up to 11 hours of talk time and up to 100 hours of music playback time. Thus, this powerful battery lets you discover and enjoy the tablet’s features while staying away from the charging socket for long. SAMSUNG GALAXY TAB A T285N 7INCH 8GB 4G ARABIC BLACK Get ready to be mesmerized with the vibrant Samsung Galaxy Tab A T285 that looks amazing in black and oozes brilliance from every angle you look at it. The huge 7inch IPS LCD capacitive touchscreen produces detailed images at resolutions of about 800 x 1280 pixels. This tablet allows you to capture precious moments with its 5MP autofocus rear and 2MP front camera. It houses a ROM with a generous internal storage capacity of 8GB, which can comfortably accommodate loads of data. The Android v5.1.1 operating system makes using this tablet simple and intuitive. The 1.5GB RAM, coupled with the 1.3GHz Quad Core Cortex A53 CPU, makes working on multiple apps a glitch free experience. Getting connected to the Internet or friends isn’t much of a hassle on this tablet, as it supports the fast 4G LTE and WiFi connectivity networks. Another standout feature of the Samsung Galaxy Tab A T285 is its nonremovable 4000mAh Lithium Ion battery that delivers a talk time of 11 hours. 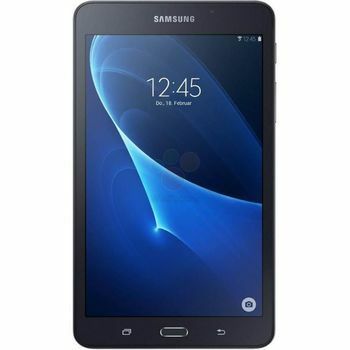 DELIVERS SMOOTH PERFORMANCE The Samsung Galaxy Tab A T285 reviews speak highly of its quick processing capabilities. At its heart, you will find a 1.3GHz Quad Core Cortex A53 CPU that sits on the Qualcomm MSM8916 Snapdragon 410 chipset. The processor, together with the 1.5GB RAM module, does its best to give you a glitch free and smooth operation. This tablet is highly interactive and user friendly, which is owing to the preinstalled Android Lollipop v5.1.1 operating system. The OS not only offers a flexible menu system but also provides built in Google Apps that make using it all the more convenient. When in need of more content, you can visit the Play Store and download apps, games, and more via a Google account. BRILLIANT PICTURES The Samsung Galaxy Tab A T285 specs peg its screen size at a massive 7inch, which is sure to make your movie watching or image viewing experience more enjoyable. Along with a pixel density of about 221ppi, this screen has a display resolution of 800 x 1280 pixels! Its IPS screen technology offers a wide viewing angle with precise clarity from every direction. SMILE AND SHARE The Samsung Galaxy Tab A T285 camera at the back, with a resolution of 5MP, captures gorgeous shots. It supports autofocus and has an f/2.2 aperture size. You can also make use of this camera to record 720p videos at 30 frames per second. If you’re a selfie fan, then this tablet also incorporates a 2MP snapper at the front. You can share all your pictures and videos with compatible devices using the Bluetooth v4.0 functionality or transfer them to a PC using the microUSB v2.0 port. PROLONGED USAGE TIME The Samsung Galaxy Tab A T285 features a massive 4000mAh battery that gives you up to 11 hours of talk time and up to 100 hours of music playback time. Thus, this powerful battery lets you discover and enjoy the tablet’s features while staying away from the charging socket for long.